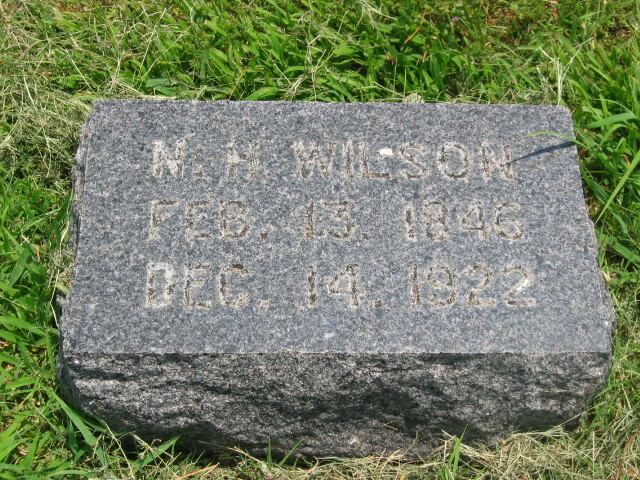 NATHANIEL HENDERSON WILSON was born February 13, 1846 in Fayette County, TN, and died 1922 in Perry, OK. He was the fourth child born to Samuel D. Wilson and MARTHA MALINDA MATILDA HENDERSON. He married ELIZABETH SWEAZEA November 13, 1867 in Shelby County, TX, daughter of MATHIAS SWEAZEA and HANNAH LUCINDA MCFADDEN STEPHENSON. She was born December 02, 1851 in Shelby County, TX, and died October 26, 1929 in Perry, Noble County, OK. Nathaniel enlisted in Company F, Border’s Regiment, Texas Cavalry in the Civil War. He volunteered in May 1864 and was discharged July 1865. Probably in the land run of 1889, Nathaniel moved his family to Indian Territory, as Oklahoma was called at that time. They were enumerated in the 1900 census in the Chickasaw Nation, township 5. They later moved to Perry in Noble County, OK, where they remained until they died. Bob Bingham, grandson of Benson Bellzora (Belle) Wilson Bingham, remembers his grandparents going to visit relatives there in probably the 1930’s, but did not know who they were. His Aunt MILLIE M. BINGHAM, Belles daughter, was enumerated in the 1900 census with birthplace listed as “Indian Territory,” so she was born there in 1895. It may be that Mack and Belle Bingham went there to participate in one of the land lotteries, but they did return to Texas. Oklahoma did not become a state until 1907, and there were six land “runs” held between 1889 and 1907. News traveled fast of the 160 acre sections of land that were laid out for homesteads. People came from all over the country, and indeed the world, to stake their claims and live in cities of tents. It was a primitive and probably wild setting, as the nearest law officials were in Fort Smith, Arkansas. MARTHA LUCINDA WILSON b. December 12, 1869 in Shelby County, TX. BENSON BELLZORA WILSON b. September 20, 1871, Shelby County, TX; d. August 11, 1960, Brady, McCulloch County, TX. HENDERSON HERRINGTON WILSON b. September 16, 1876, Shelby County, TX. HELEN WILSON b. Abt. 1877 in Texas. EMILY ELIZABETH WILSON b. Abt. 1878 in Texas. 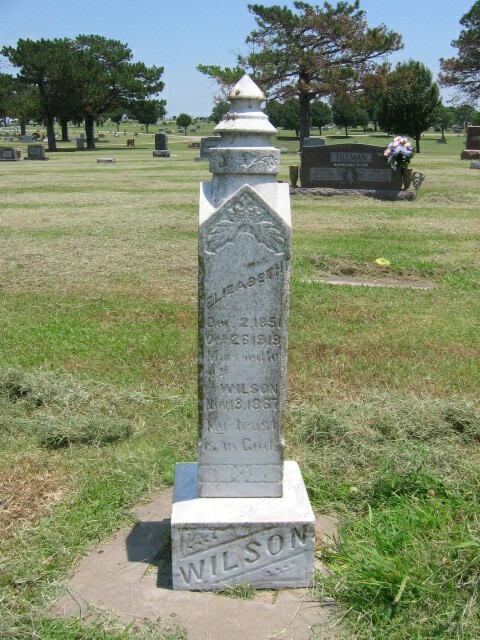 JESSIE DENSON WILSON b. February 09, 1883, Granger, Williamson County, TX; m. DELLA REBECCA TUMMELL. EULAH AUGUSTA WILSON b. January 21, 1888, Granger, Williamson County, TX. SWEAZEA Samuel WILSON b. May 01, 1889, Granger, Williamson County, TX. National Archives microfilm of Texas Confederate veteran’s service records. Film #M323-188.